Progressive metal band from Germany formed around 1989 with Dirk Godau - guitar, Frank Jauernick - guitar, Ingo Holzhauser - bass, Roger Ihmann - drums and Marco Witte - vocals. Released one demo and then Marco left, Dirk came in as new vocalist and the lineup recorded a CD entitled, A diary of Inner Visions in 1992. Pro printed covers. 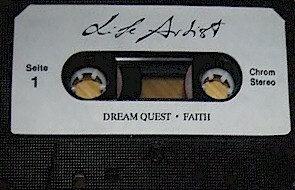 Studio tapes with a sticker on the shell.